STARS by Malorie Verdant APRIL 30th! He changed my life. With a smile, a flick of his wrist and a death-defying stunt. He was six and I was five. And now, thirteen years later, I am hopelessly in love. There is only a slight problem. He doesn’t know I exist. He’s the star quarterback. I’m a science nerd who hides in the shadows. I don’t need anyone to tell me that college won't change anything. I know he’s the star of this story. And I belong in the audience. One Broken Promise, A Citadel Series Novella By Deanndra Hall Originally released as part of the Loving Dangerously Box Set Buy it Now – Only $1.99Amazon ~ BN ~ Kobo Hayden Patterson has a simple rule. 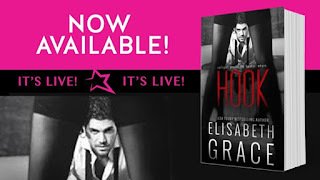 Meet Marco Valenti in Hook by Elisabeth Grace! He’s gorgeous. He’s reckless. And he’s every woman’s dirty fantasy in the state of California.., except one… Quinn Ashby. Recent graduate of Penn and top of her class, Quinn is whip smart, ambitious and interning as the new marketing coordinator for the Bexley Bruisers American Hockey League team. The last thing she needs is to waste her time on guys…especially one as lethal to her focus as Cash Brooks. But once the bad boy hockey star tempts her into his world, threatening her professional future, she’s forced to decide whether to let him into her heart…or to leave him behind forever.